Image Credit: Sarah Shatz/Netflix via Entertainment Weekly. The lid is being lifted on Marvel and Netflix’s four-way crossover series The Defenders. We’ve got our first look at Sigourney Weaver’s villain, and a few intriguing details about what will bring Daredevil, Jessica Jones, Iron Fist, and Luke Cage together... and it might have something to do with Daredevil season two’s hilarious giant hole. Entertainment Weekly’s latest cover story has been revealed as our first look at The Defenders. Here’s the cover itself, which unfortunately does not show us Danny Rand in his Iron Fist costume, but does tell us he’s perhaps going to spend a silly amount of time running around with his shirt unbuttoned when he’s not wearing it? The few details we actually have so far are slight, but full of intrigue. 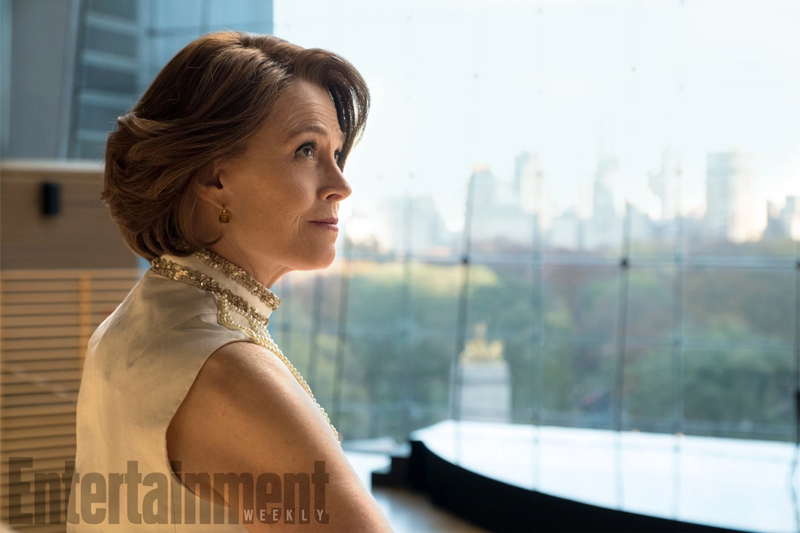 There’s the first look at Sigourney Weaver’s villain, above, who now has a name: Alexandra. That’s pretty much all we’ve got about her, with no details other than that—according to showrunner Marco Ramirez—she is a “powerful force in New York City” who is “sophisticated, intellectual, [and] dangerous.” Most interestingly, Entertainment Weekly notes that Alexandra has no code-name and no connection to a specific character from the comics, but whether that’s an obfuscation for the sake of keeping her identity secret or she is a wholly original character for the show remains to be seen. Each Defender has arrived separately at the offices of Midland Circle (a name that should sound familiar to Daredevil fans as the shady operation behind a giant, literal plot hole in season 2), and none of them expected to cross paths. But before they can properly meet and greet, the four have wound up trapped in the middle of a corridor and must brawl their way past a group of enemies. That’s right. The Defenders are each investigating the mysterious company behind Daredevil season two’s most absurd mystery, the literal giant hole the Hand were digging up in Hell’s Kitchen that went entirely unexplained... until now maybe? As much as that damn plot hole vexes me, I’d be utterly delighted if it really is the mystery that brings the Defenders together. We’ll be finding out even more about Marvel’s Defenders very soon, by the sounds of it.